Have you seen this picture on IPTV Festival? Well, it's on the wall to the left of Dan Wardell and is blown up really big! And I'm not positive, but it looks like it's also one of the pictures on the Kids Club Card! How cool is that?! This morning I heard Adeline yell, "Mom! I just saw my drawing on TV!" Congratulations, Addie! How awesome it that!?! What a talented little artist and writer you have at your house! Now we'll have to watch IPTV until we see it! Awesome! Addie's been "discovered". That's amazing. Yes, you should buy the card! How fun! I'm going to try to watch and see it! Okay, so maybe it's not the Kids Card, but it's on some card included in the Family Fun Pack. Either the Family Fun pass or a postcard? 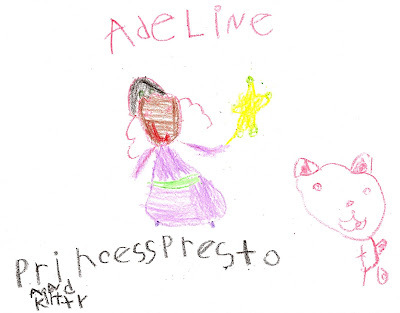 Yay Adeline! (I love that name, by the way...) Maybe this will propel her into artistry because her confidence is so bolstered by fame!